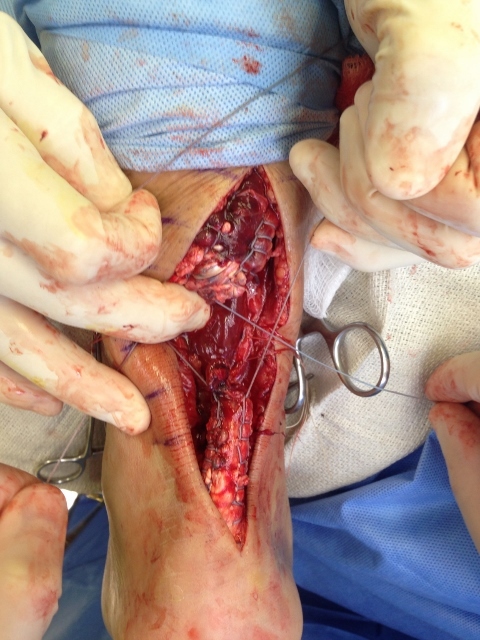 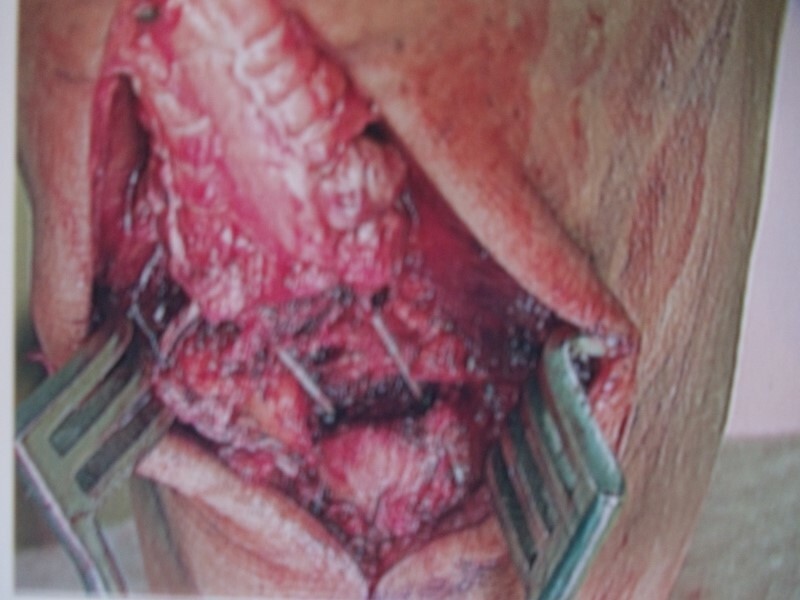 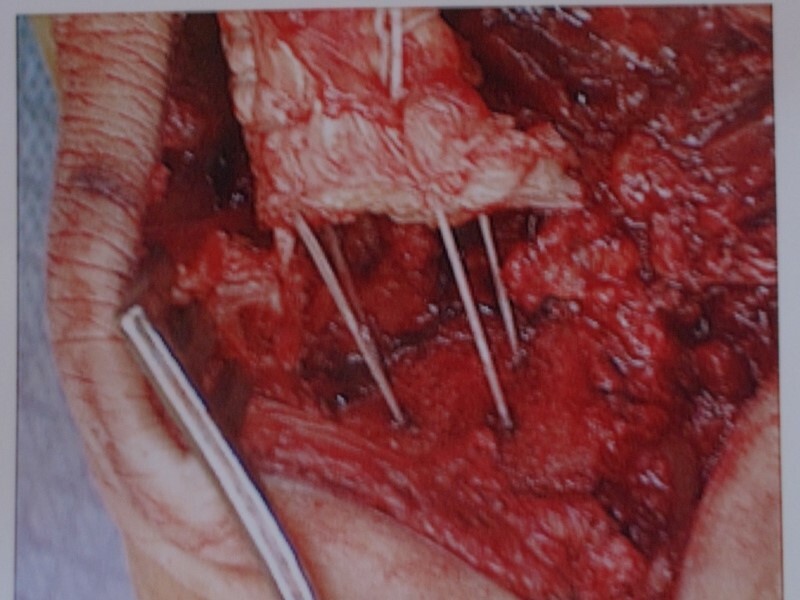 Below are intra-operative pictures of an Achilles tendon repair. 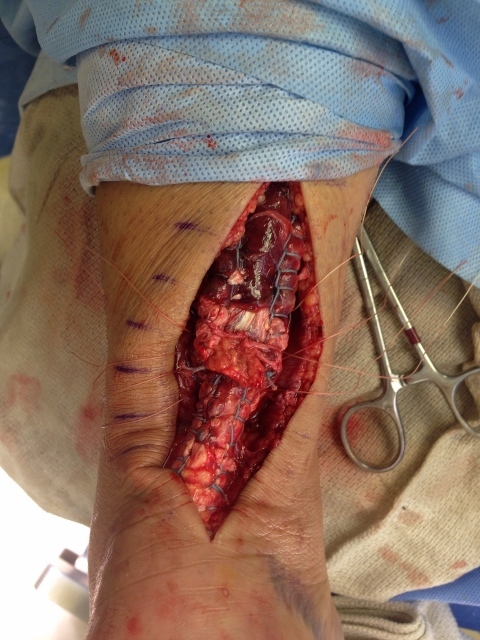 The image to the left is a tendon that has been repaired to be reattached with sutures in place and tendon cleaned of the diseased tendon. 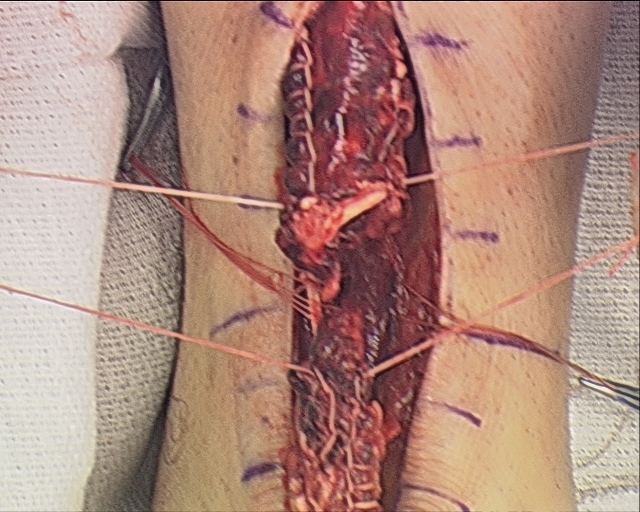 The picture to the right is the tendon re-approximated with sutures tied. 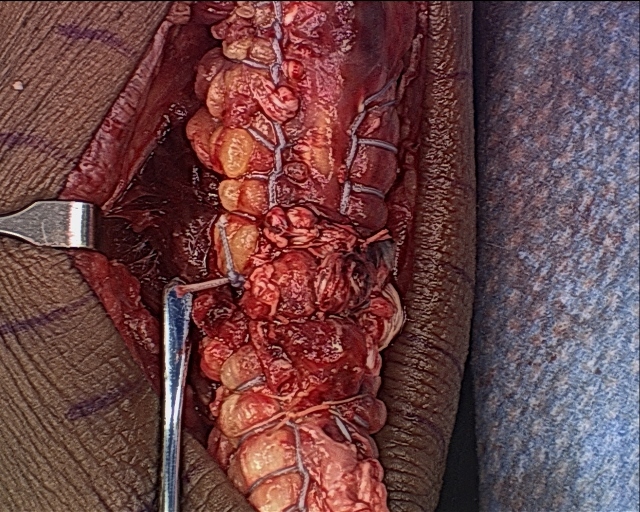 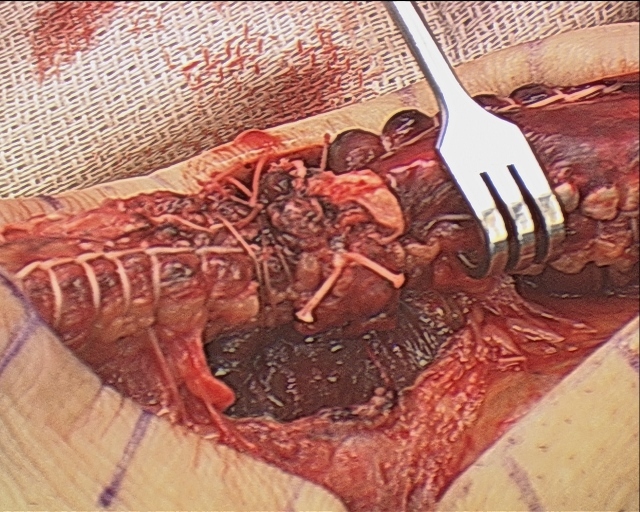 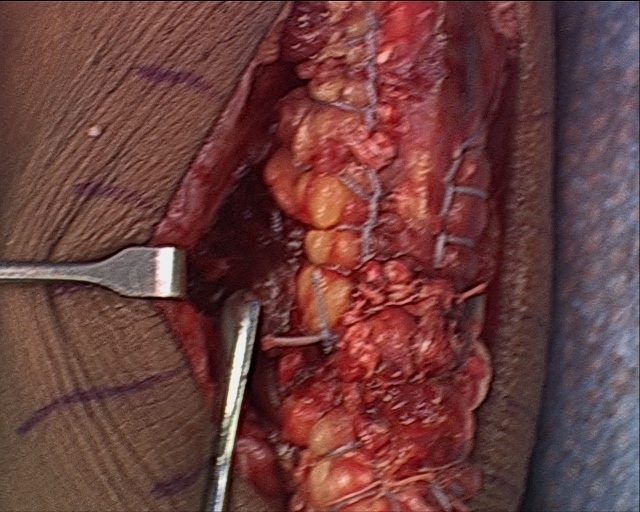 This is a pic with the sutures on both ends of the rupture prior to be tied. 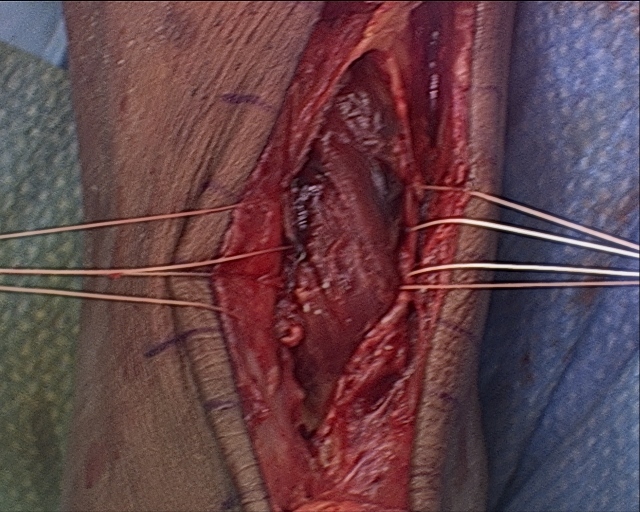 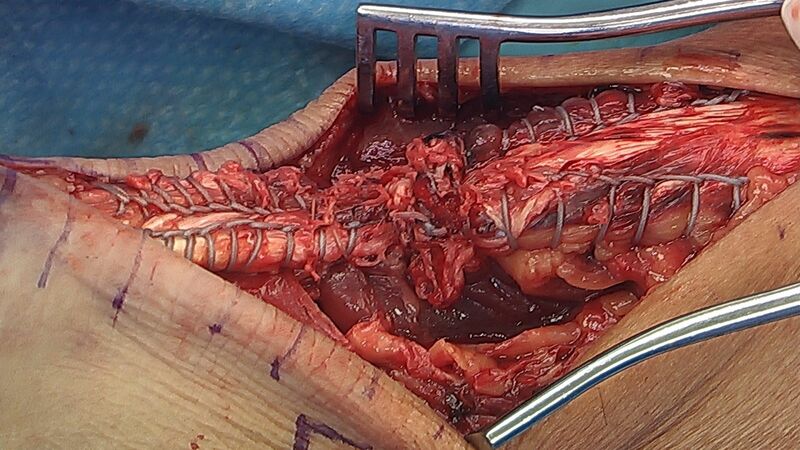 Krackow suture of both Achilles rupture stumps. 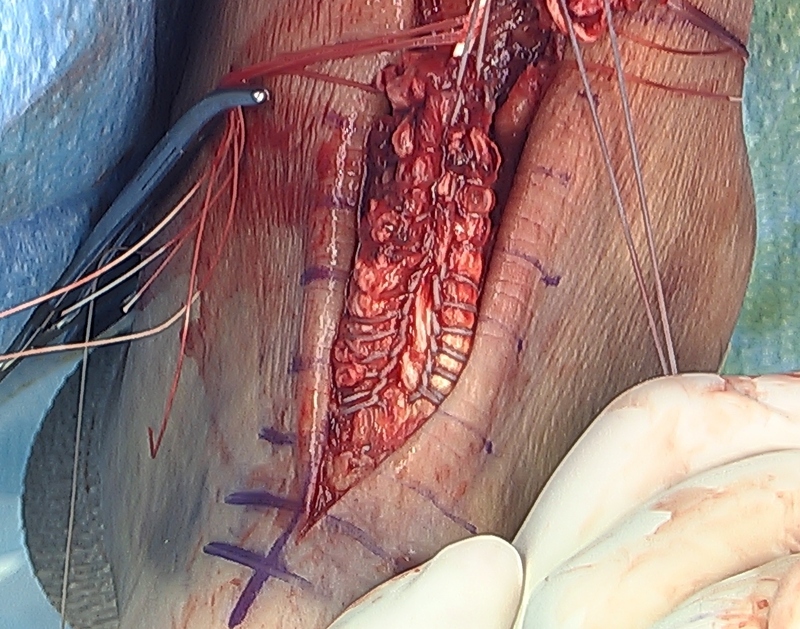 Reapproximation of the ruptured ends of the Achilles tendon. 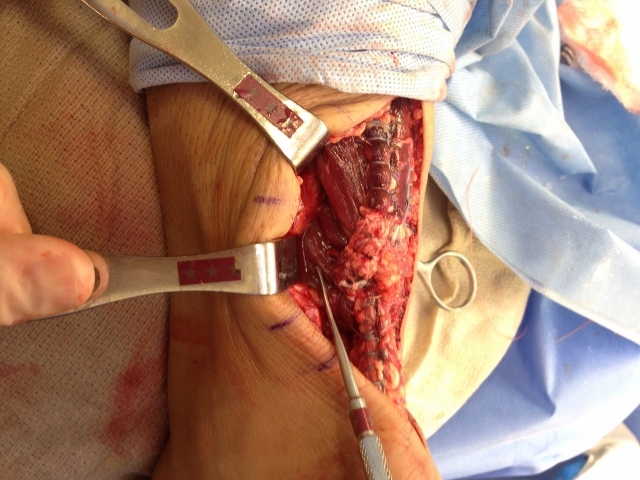 Completed repair of the achilles tendon. 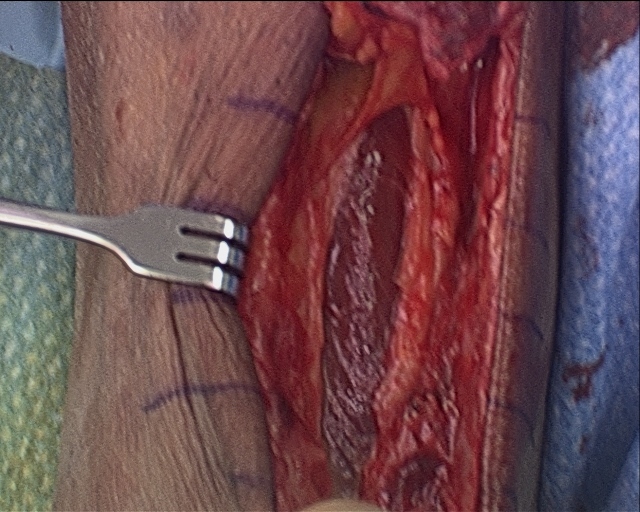 The window is made in the fascia between the Achilles and FHL muscle (muscle that moves the big toe down). 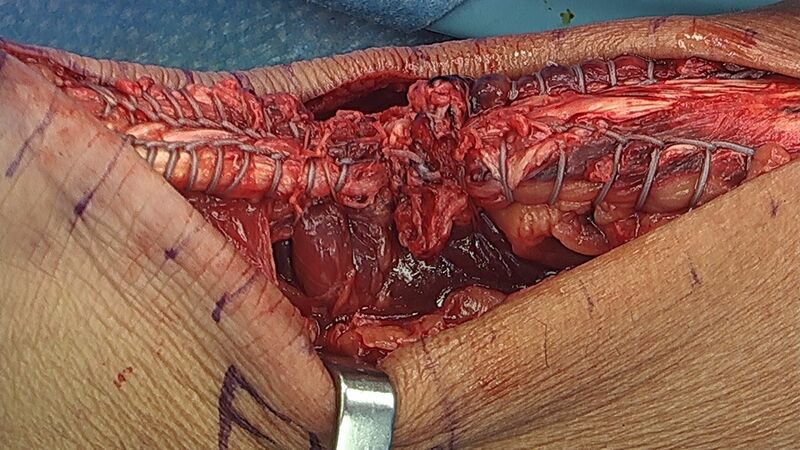 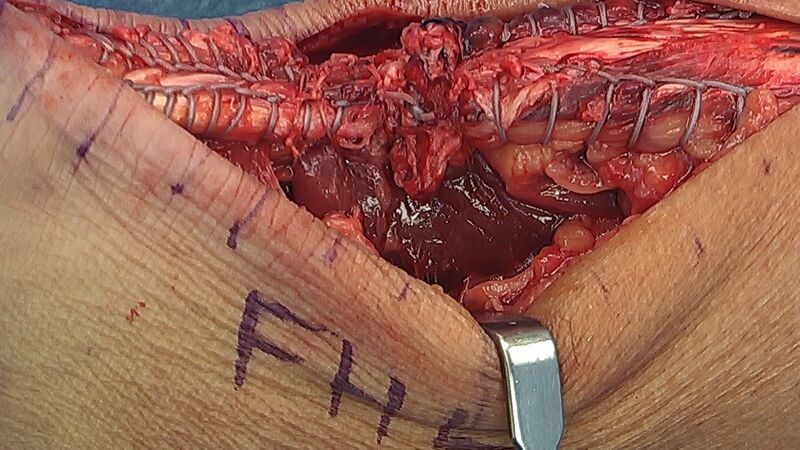 We pass suture into the muscle and this can be seen in the fingers on the left and right of the pic. 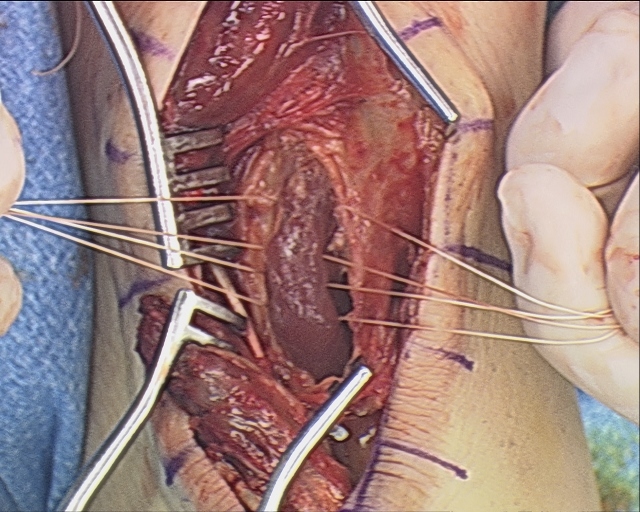 The tendon is tied together and the sutures placed in the FHL muscle are tied around the tendon to tranpose the muscle to the tendon repair to increase vascularization to the tendon and promote better healing. 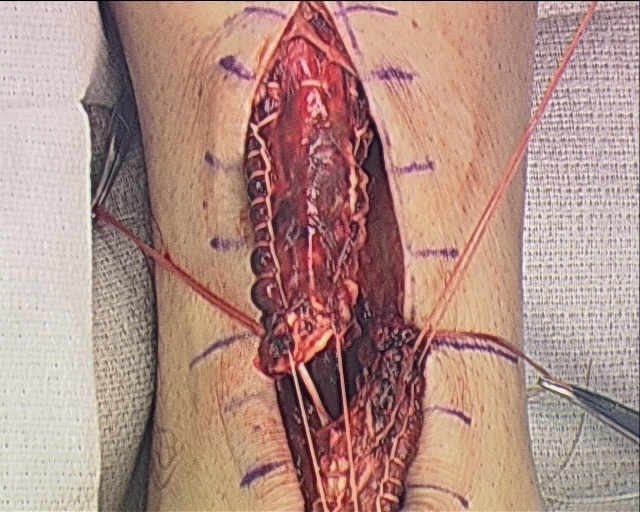 We have repaired the Achilles and are preparing to transpose the FHL muscle to the repair site to increase vascularity. 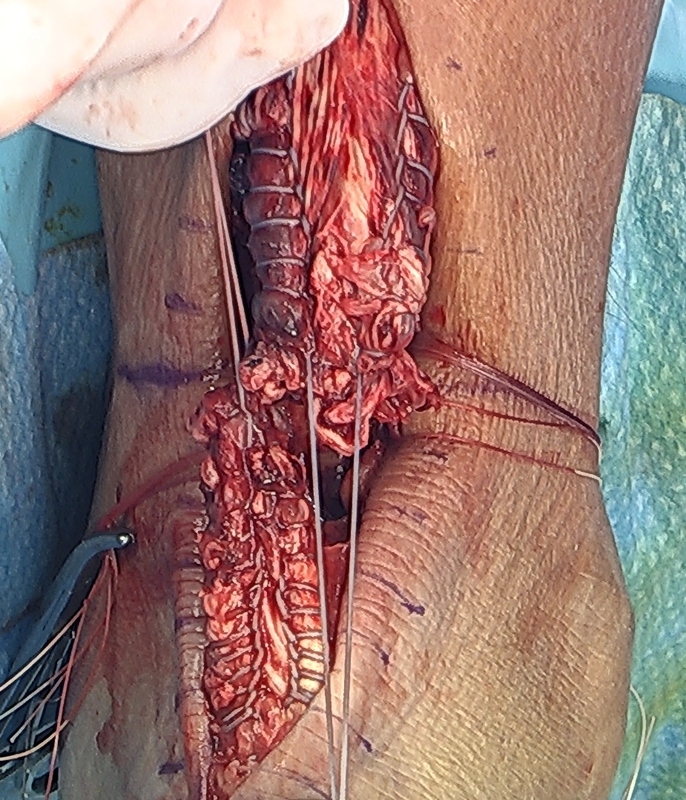 The four sets of white suture can be seen on the sides of the Achilles. 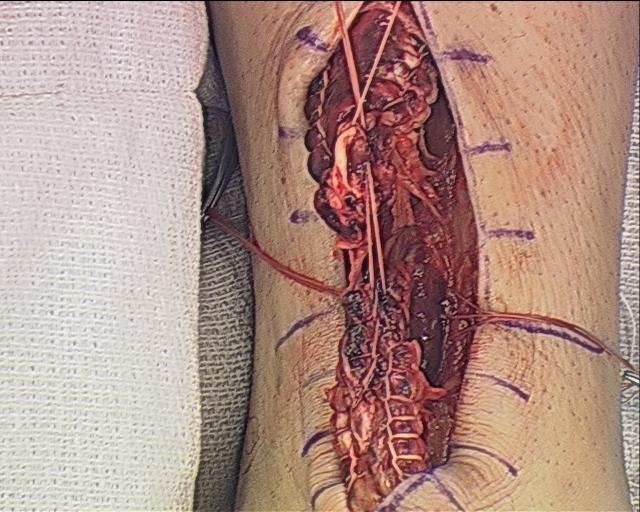 Pic after complete repair with muscle transposition. 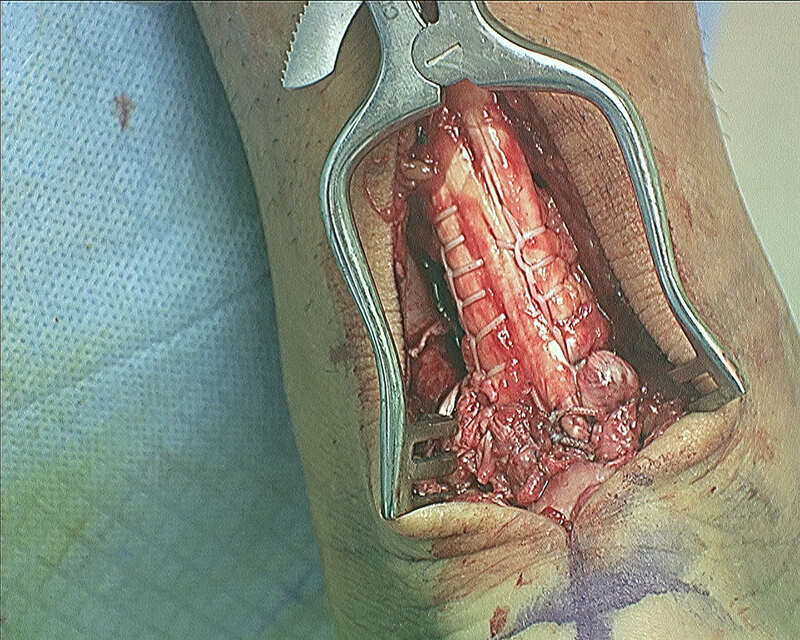 Pictured below is an image of a torn Achilles tendon. 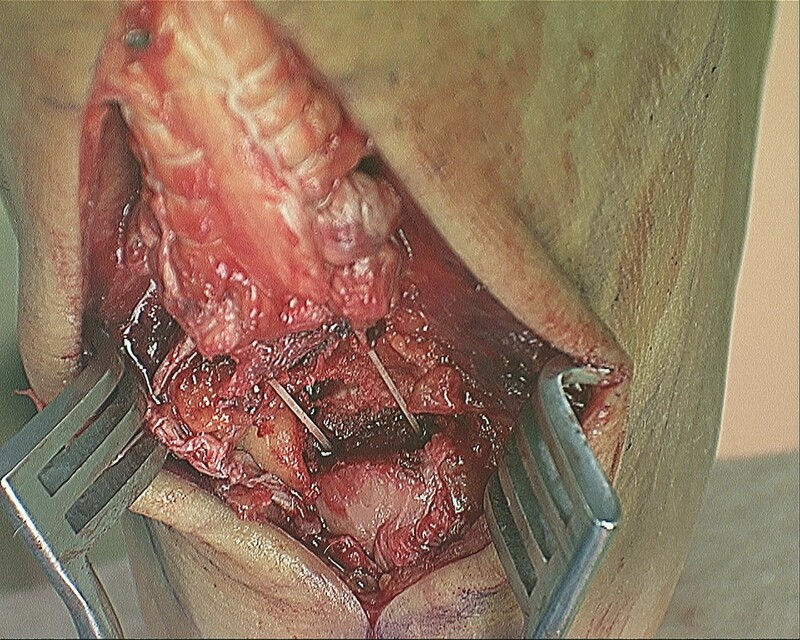 The ends are frayed because this is a result of a chronic degenerative process similar to when a rope startes to wear out and then finally gives out. 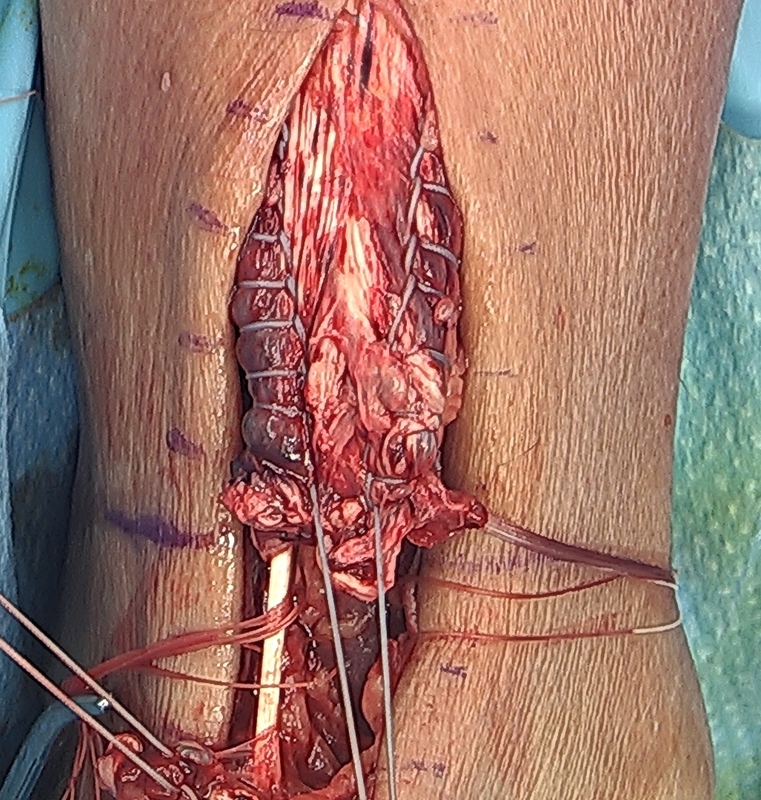 Another case of a torn Achilles tendon as a result of chronic degernation of the tendon fibers. 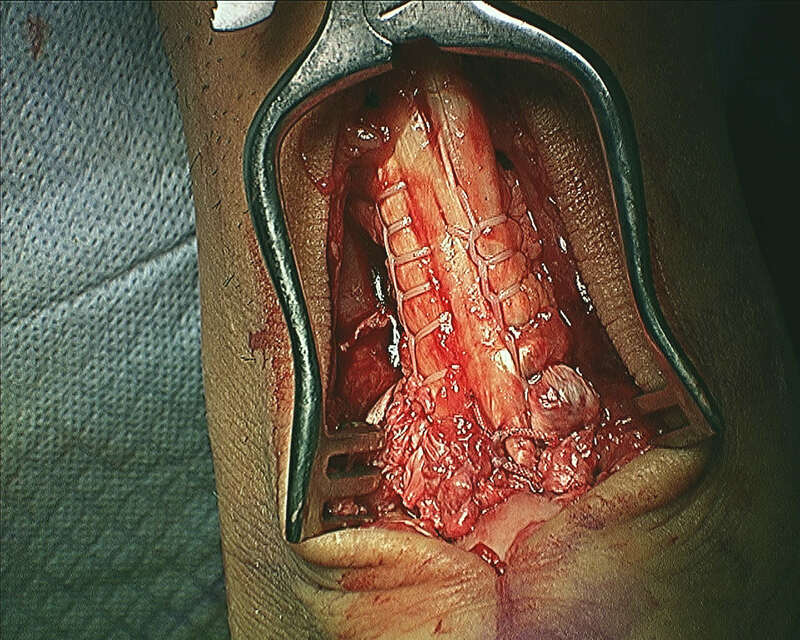 Intraoperative picture of an avulsion of the Achilles off the calcaneus. 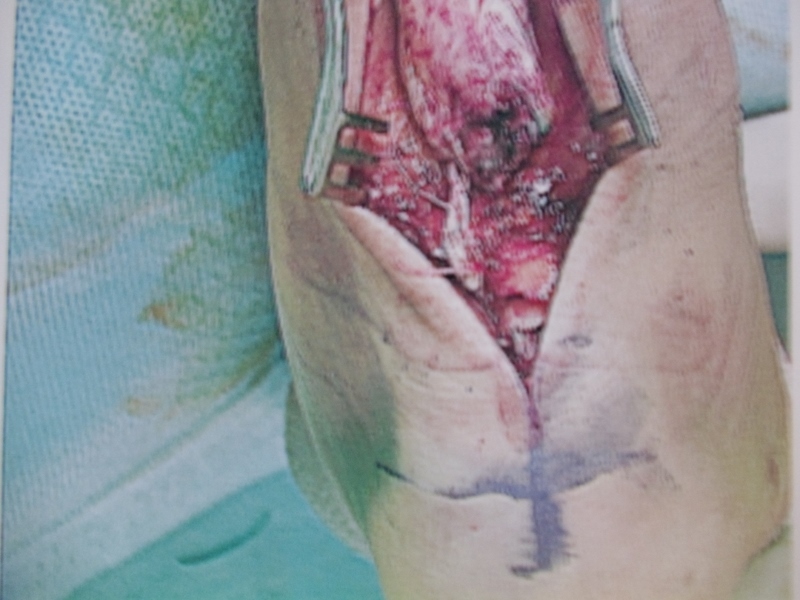 Below the Achilles is pulled through a trough in the heel bone to re-anchor it down). 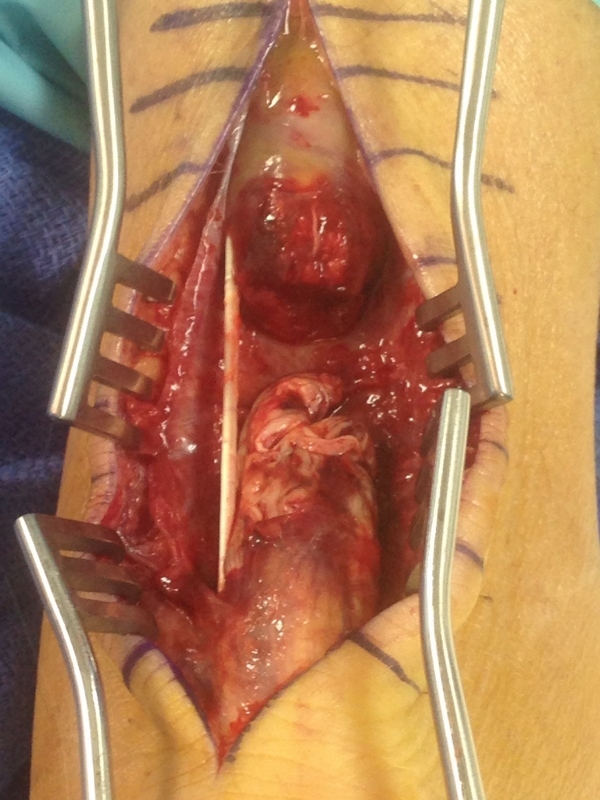 Pic below of an avulsion of the Achilles off the heel bone prior to repair and re-anchor through the heel. 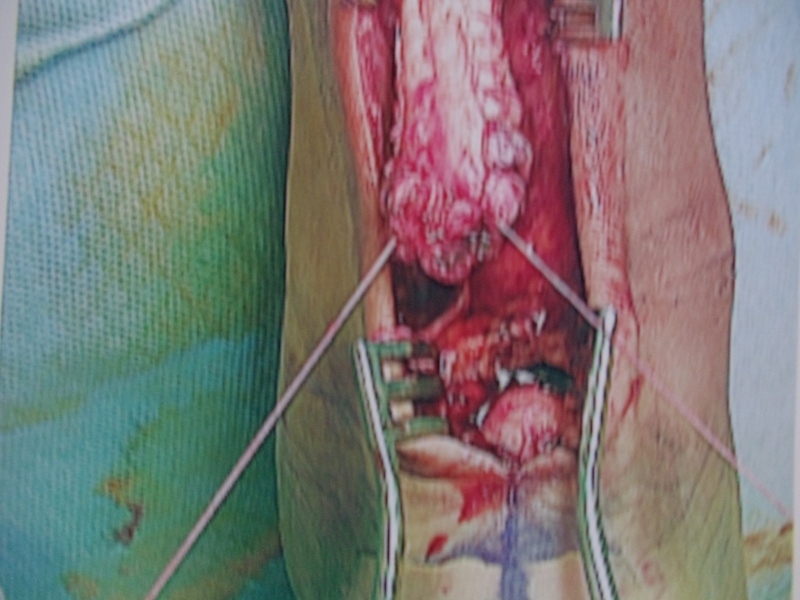 Achilles rupture intraoperatively before and after repair. 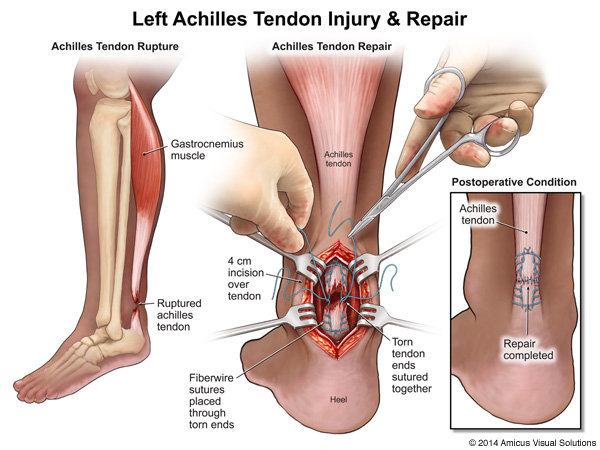 The Achilles is torn off of the back of the calcaneus and a portion of the heel is still attached to the Achilles. 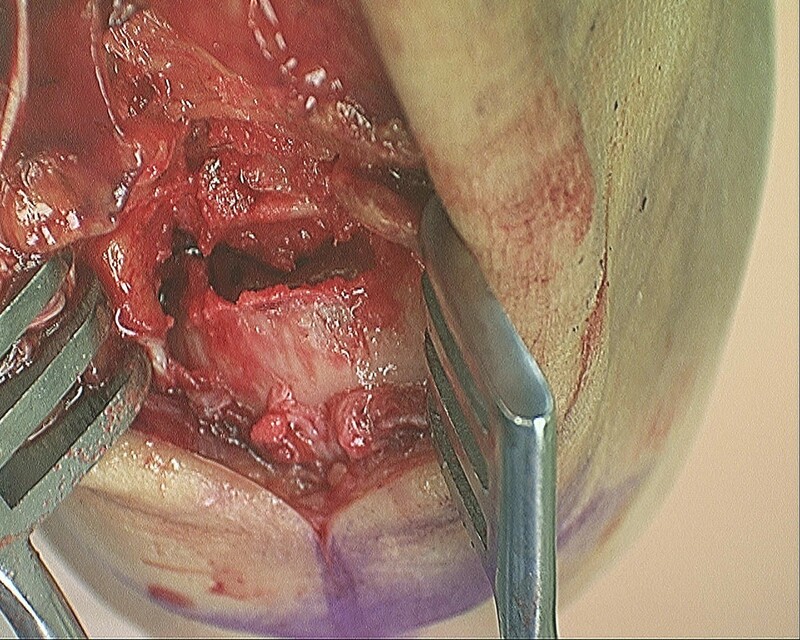 The back of the heel bone is the rounded yellowish bone at the bottom of the incision site. 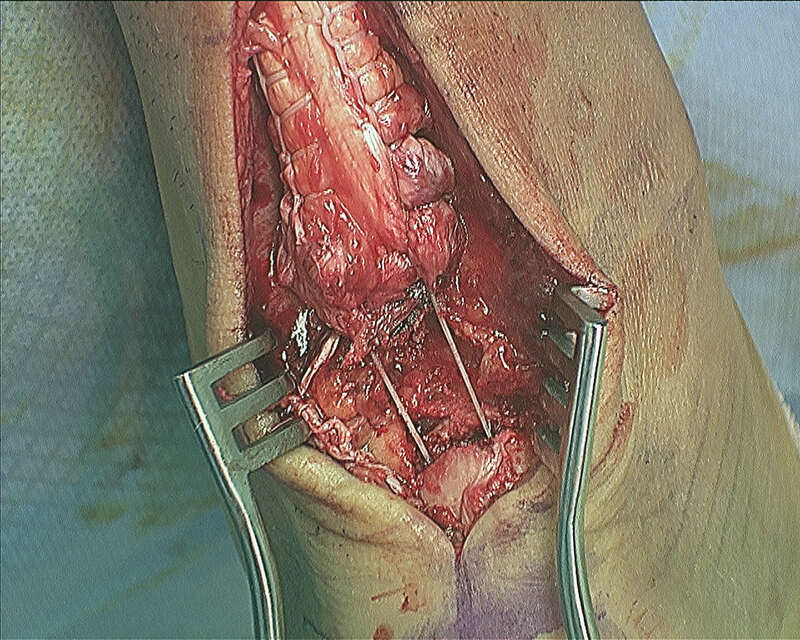 Nonabsorbable suture has been weaved through the Achilles to repair it back to the back of the calcaneus. 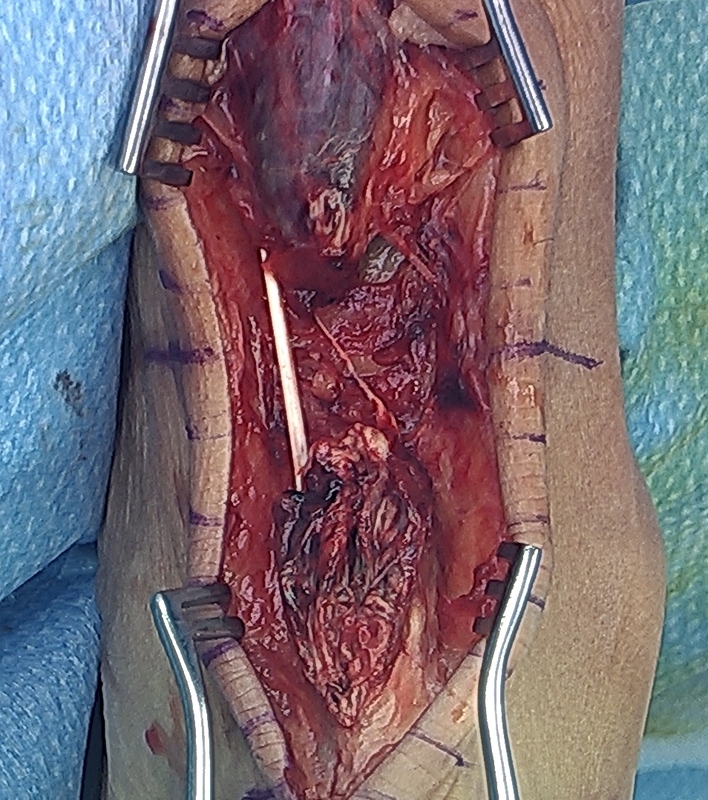 A trough is made in the calcaneus to allow the tendon to have ingrowth at its reattachment site in the posterior heel. 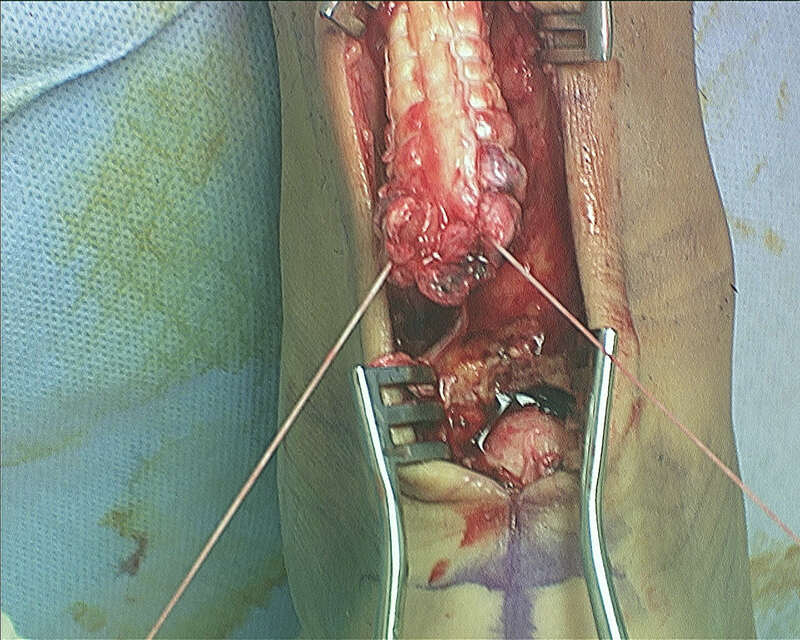 The Achilles is tensioned down into the trough and reattached to the calcaneus. 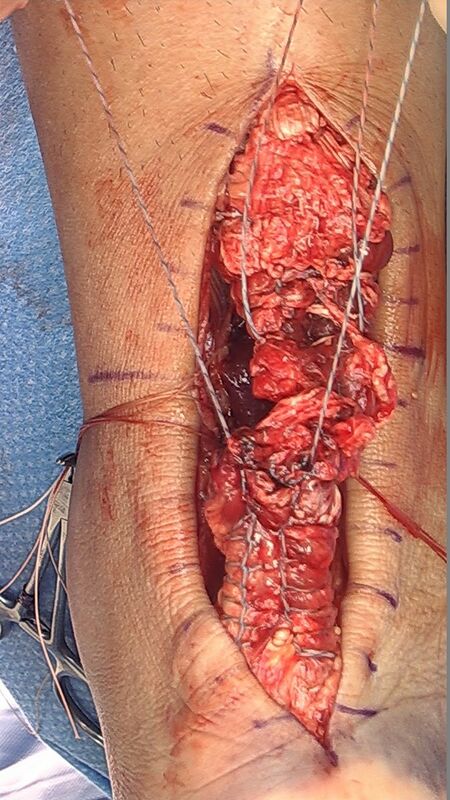 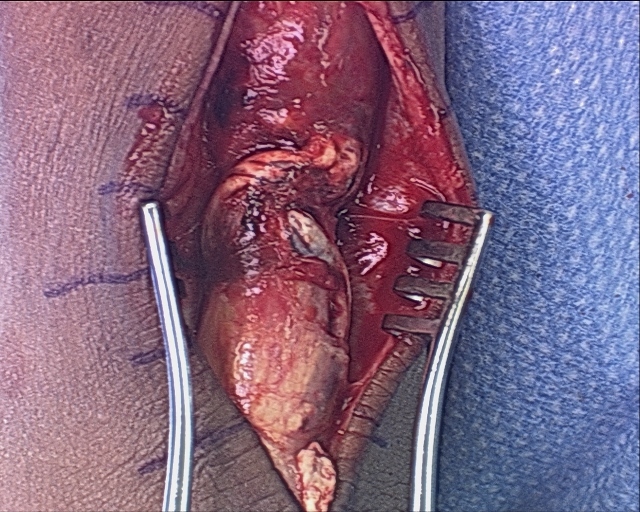 Intraop pic of Achilles rupture prior to repair. 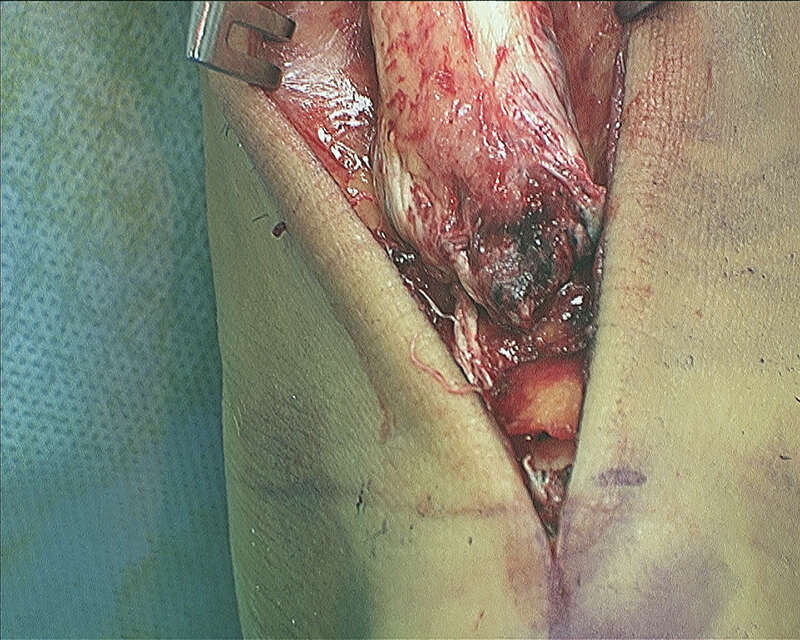 There is a 1-cm gap between the tendon ends. 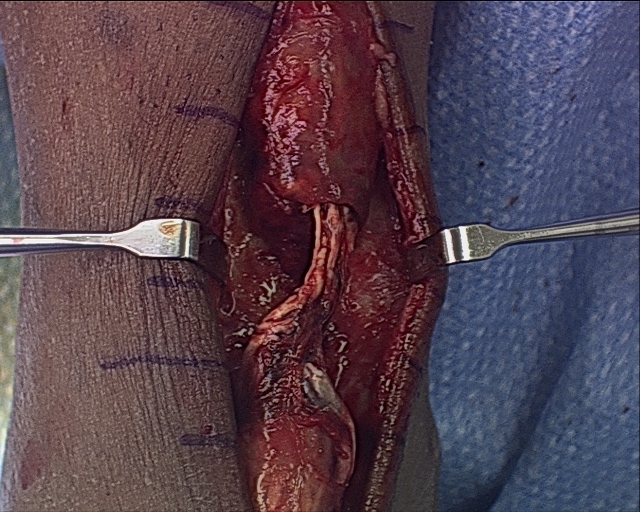 The white tendon on the left is called the Plantaris. 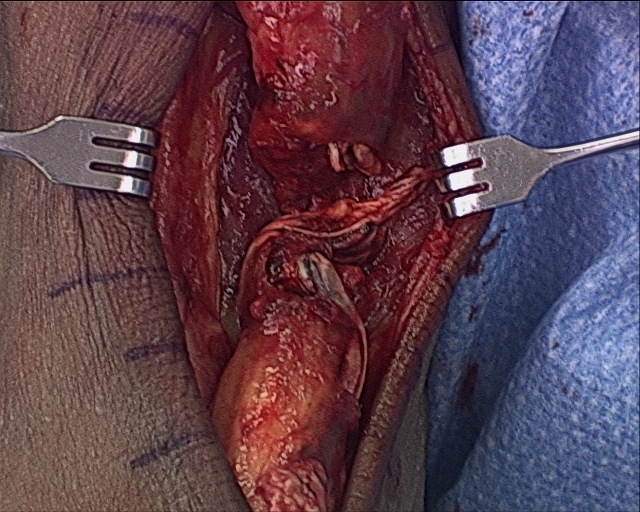 Due to this tendon being intact, the Achilles didn't retract much after the rupture. 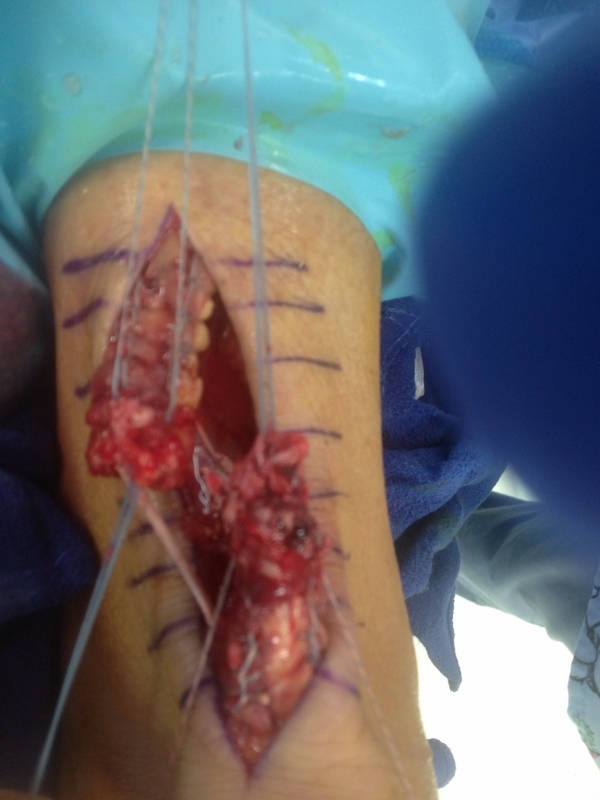 These are final pics of the repair with the tendon edges tightened before and after the suture ends are cut. 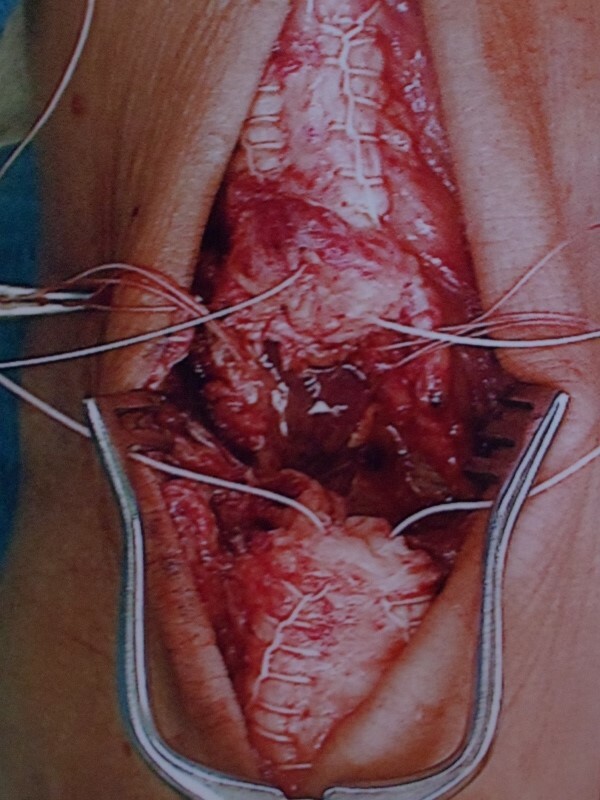 Intraoperative pics of Achilles tendon rupture before and after repair. 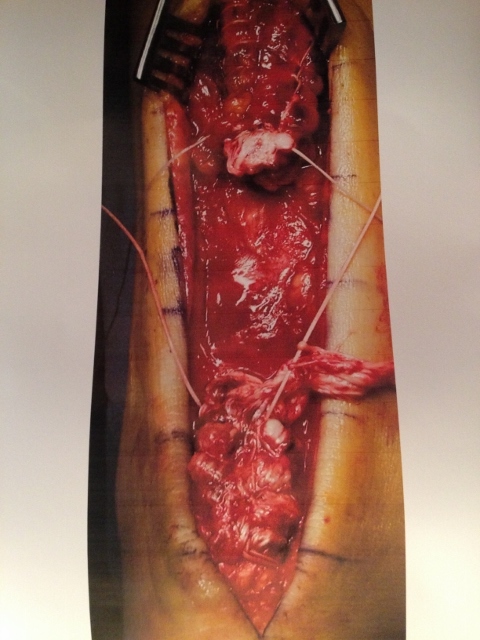 Intraop pic of Achilles rupture before and after repair.